Probably the coolest part of participating in the One Room Challenge™ has been witnessing the creative talents of so many people on display. I love seeing the care and thought everyone has put into making beautiful, functional spaces for themselves, their families, or their clients. I have a ton of new ideas for my own house, thanks to my fellow ORC bloggers, and look forward to implementing some in the coming months. On my Instagram, I recently shared a few of my favorite rooms from the featured ORC designers, and now, I’d like to highlight some of the guest participants’ rooms that really stood out to me over the course of the challenge. Where to begin? 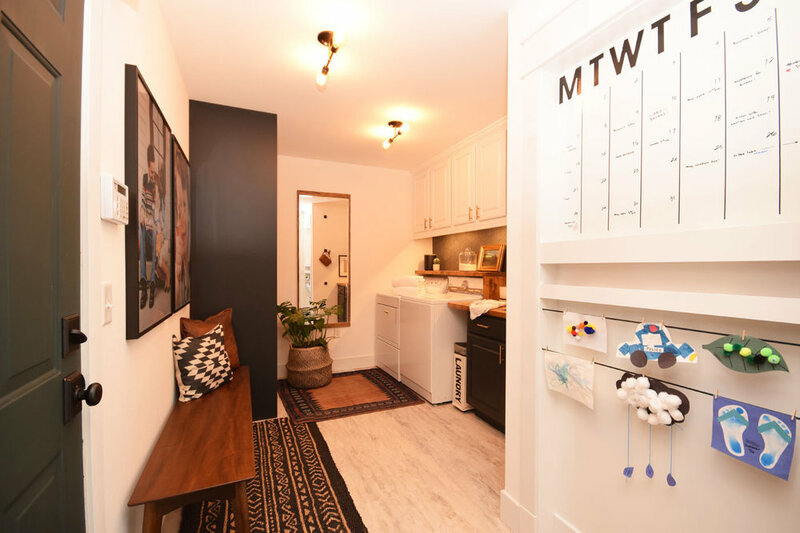 I just love these guys, from the glimpses they’ve given us into their lives as a couple and parents to an adorable little boy, to their phenomenal DIY dedication to transforming a formerly drab laundry area into a sleek, modern space with a fun message center. They even changed the layout of the space to improve the flow into the rest of the house. Meghan’s Instagram stories have kept me smiling throughout the challenge, and the reveal photos look amazing. Check them out! 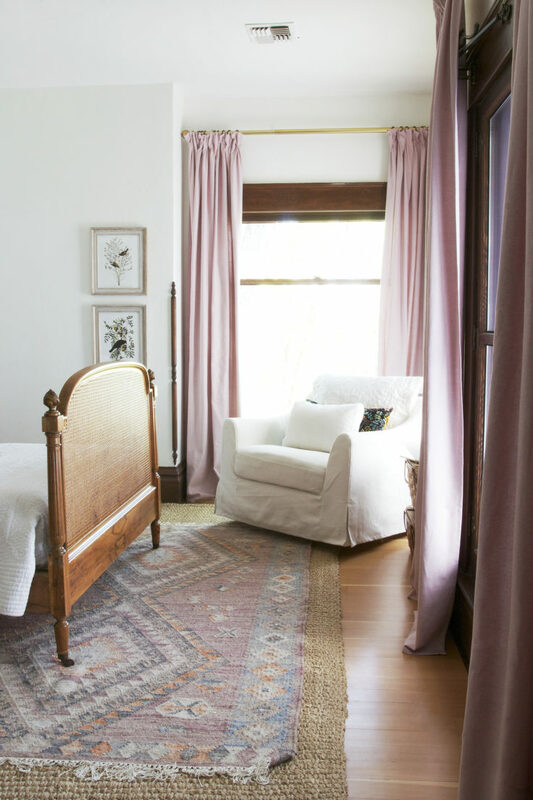 I adore the muted rose color palette of this room and the antique bed (which I’m so glad to see didn’t get painted!). There are lovely touches throughout, from rugs to artwork, and as I commented on one of Cathy’s posts, I wish I could snuggle my own little ones in this room. I also love how much they accomplished on a small budget. I can’t get over the coffered ceiling Lindsey has created. The rest of this room combo is really tastefully designed and decorated, with many other neat elements, but to me, the ceiling makes the biggest difference. Mmm, I love the dark earth tones of this room. Emily has a great balance of colors and textures that make me want to lay down and take a nap on the velvet-pillowed bed. She even made her own abstract wall art, which is quite impressive. The transformation here is stunning. 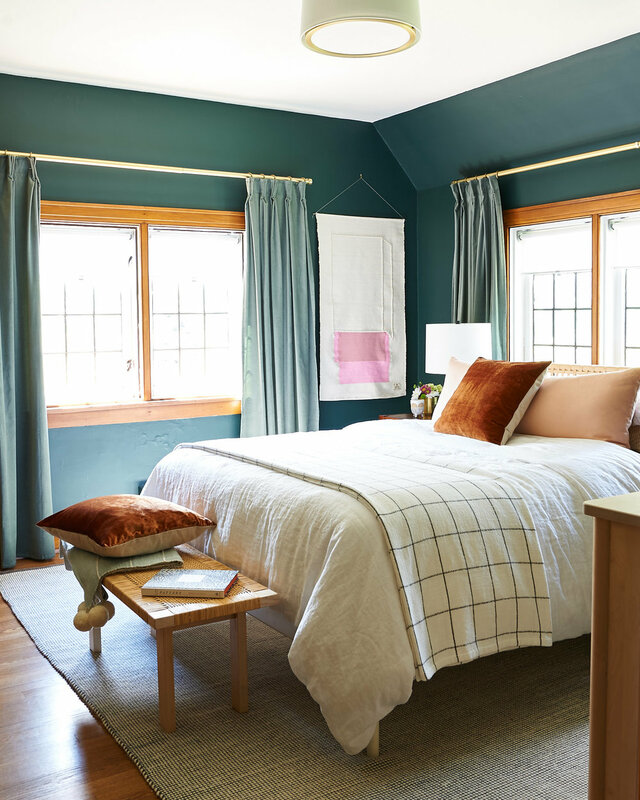 The room had nice bones, and Kate definitely made the most of them, particularly with the addition of a beautiful window seat and a cozy assortment of pillows in blues and purples. The blue ceiling adds so much to the calm atmosphere of the room. 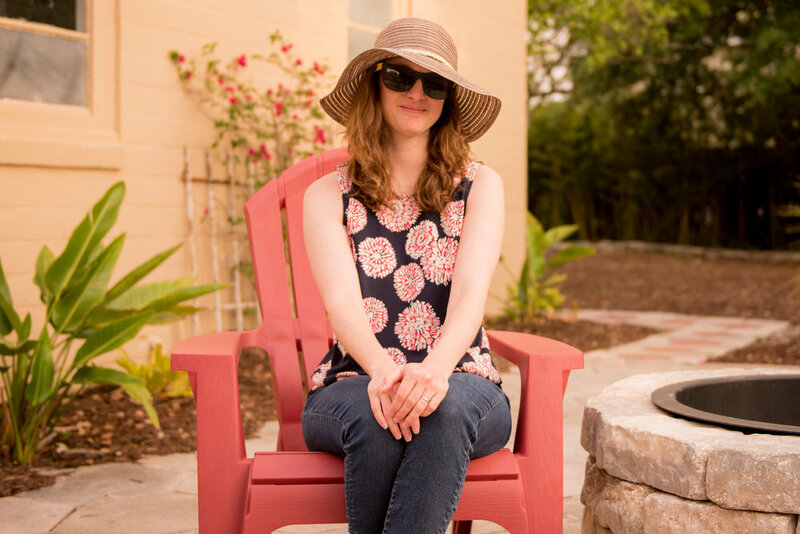 Teri’s sunny personality shines through in her room and her Instagram. Her running commentary throughout each week has been such fun, and she’s got a great eye for budget upgrades to a space. Her dining room looks like just the place I’d like to go for a lovely summer party, especially with her as a hostess, and she put a lot of work into it, which shows. What were some of your favorite rooms from the One Room Challenge guest participants? Thanks to everyone for your inspiration and motivation!